You are here:Home » Blog » Design and Infrastructure » Camden Circuit Trails Plan Completed! 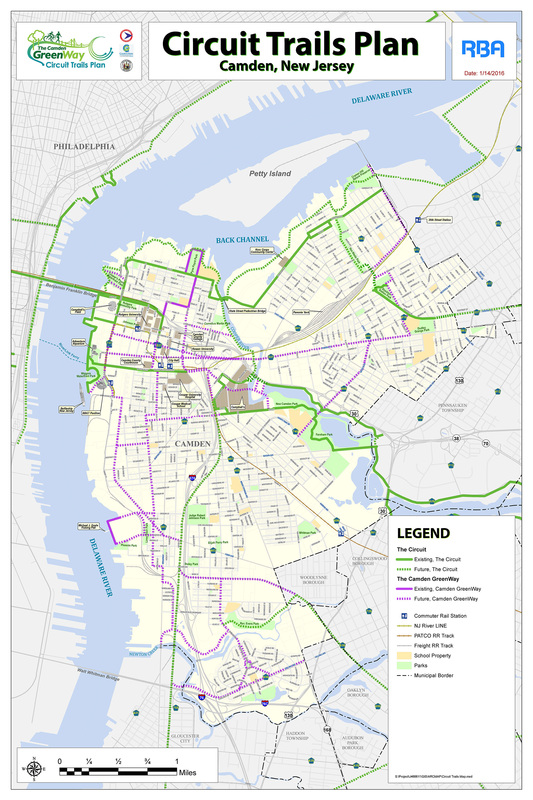 Camden City recently completed the Camden Circuit Trails Plan, thanks to the New Jersey Department of Transportation (NJDOT) Office of Bicycle and Pedestrian Programs Local Technical Assistance Program (LTA). This plan, managed by Coopers Ferry Partnership, was used to update the Camden portion of the 2010 GreenWay Trail Location Study showing all new construction and restoration of trails. This refers to designated bicycle and pedestrian facilities, both on and off road. This planning effort also supports the ultimate desired outcome of the construction of a network of active transportation infrastructure to promote and support bicycle and pedestrian transportation throughout the City of Camden, with regional connectivity. Lastly, the study is intended to identify trail routing solutions between the Camden GreenWay and the Circuit, a multi-use trail network connecting Pennsylvania, New Jersey and beyond.